Cream the butter and cheddar together in a medium bowl with a wooden spoon. Add the flour and salt and stir. Cut the flour into the butter using 2 knives, a pastry blender, or your hands. Sprinkle the water onto the dough and stir with a wooden spoon or a fork to incorporate the water into the dough. Do not overmix or knead too much. Dump the dough out onto a lightly floured, flat surface and form into a ball. Remove one third of the dough, form into a ball, and flatten into a circle about 1/2 inch thick and wrap with plastic wrap. Flatten the other piece of dough similarly 1/2 inch thick and wrap. Refrigerate both disks for 30 minutes. Preheat the oven to 375º. Lightly oil a 9 to 10 inch pie pan and set aside. Remove the larger disk of dough from the refrigerator and place it on a lightly floured, flat surface. Roll the dough into a circle a bit larger than the pan. Fold the dough over a rolling pin and transfer it to the pie pan. Press the dough into the pan and cut off the excess around the edges. Set aside and refrigerate for 15 minutes. Remove crust from the refrigerator and place a layer of both kinds of apples, using about half the apples, in concentric circles on top the piecrust. Mix the sugar, cornstarch, cinnamon, and nutmeg together in a small bowl. Sprinkle half the sugar mixture over the apples. Top with half of the raisins and half of the nuts, if using. Place another layer of apples in the pan and top with the remaining sugar, raisins, and nuts. Drizzle with lemon juice. Remove the smaller disk of dough from the refrigerator and place on a floured, flat surface. Roll the dough to a round about the size of the top of the pie. Cut the dough into strips about 1/3 inch wide using a knife or a pastry cutter. 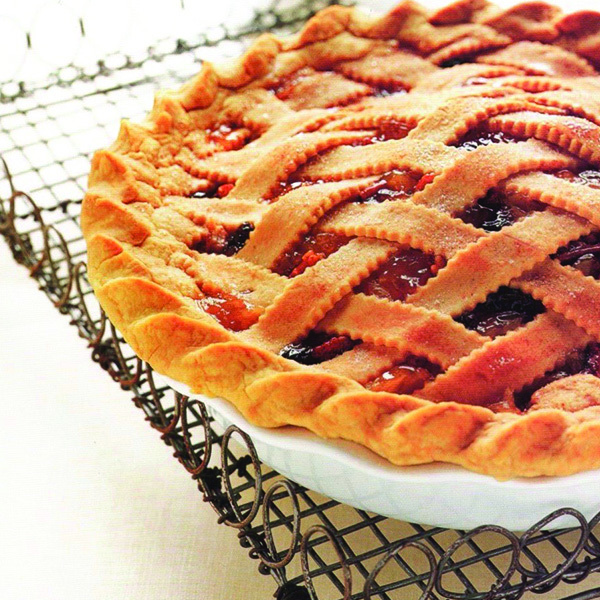 Weave the strips to form a lattice work pattern on top of the pie. Crimp the edges of the crust and the lattice together by pinching the dough. Place the pie pan on a baking sheet. Place in the oven and bake for 40 to 50 minutes, or until the apples are bubbling and the crust is golden brown. Remove from the oven and let cool before cutting. To serve, cut the pie into wedges.